Is Your Roof in Rancho Cucamonga, CA or surrounding area Leaking or Damaged? Replace a severely damaged roof to protect your home. Avoid structural damage by getting a roof repair service. Improve the structure of your business with a roof repair. Make sure your roofing system abides by code regulations. Keeping a secure roof over your head is an essential part of property maintenance. Protect the interior of your space in Rancho Cucamonga, CA or surrounding area by hiring a roofing contractor. 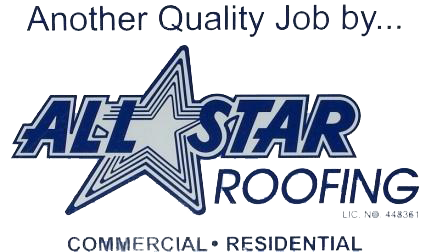 Allstar Roofing is a full-service roofing company in Rancho Cucamonga, CA. We specialize in roof repair, reroofing and roof replacement services. Whether you have a commercial or residential building, you can trust our 45 years of industry experience. We're proud to offer a 5-year warranty on all reroofing services. All projects are inspected and approved by our owner for your benefit. Call us now to schedule your service in Rancho Cucamonga, CA and serving the surrounding area. No matter the season, our roofing contractor is available to provide a solution to your biggest challenges. Call us now to schedule your roof repair or replacement in Rancho Cucamonga, CA.